Different fungi have been used to demonstrate mating in fungi including Neurospora (Griffiths, 1979), Aspergillus (Denison, 2000), and Sordaria (Fields, 1970) and kits for demonstrating mating in Sordaria are available from Carolina Biological, Inc. The present demonstration allows students to see both that fungi have different mating types and that one strain acts as the female parent. It takes advantage of the rapidity of Neurospora growth and the ease of using fluffy strains (Table 1). Strains carrying the fluffy lesion are mated with fl per-1 strains and the pattern of perethecial color on the resulting plates shows which strain was the female parent. 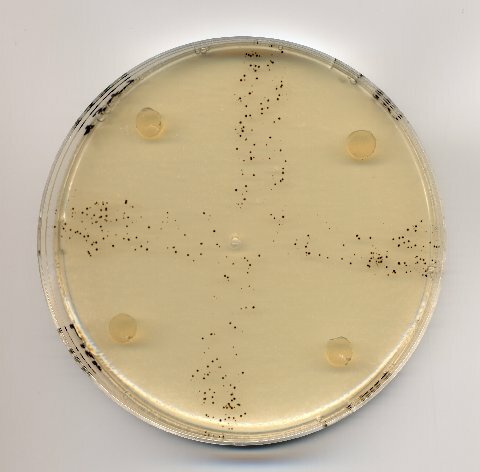 Matings were carried out on cornmeal agar (Difco #238620) using mycelia also grown on cornmeal agar. The inoculum was cut from the starter plate using sterilized drinking straws or a cork-borer. This allows for a very uniform inoculum which contributes to the even and predictable nature of the resulting cross plates. Agar plugs can be transferred to the mating plates using sterilized toothpicks or with inoculating loops. Plates were incubated at 22 - 24 C and rapid growth was observed after overnight incubation. After five or six days perithecia were visible as a line separating the original colonies (Figure 1). The production of white perithecia, where the per-1 parent acts as the female parent, is shown in Figure 1.A. The double line of perithecia, as described in Griffiths (1979) is clearly seen in Figure 1. A. where two strains are paired on one plate. 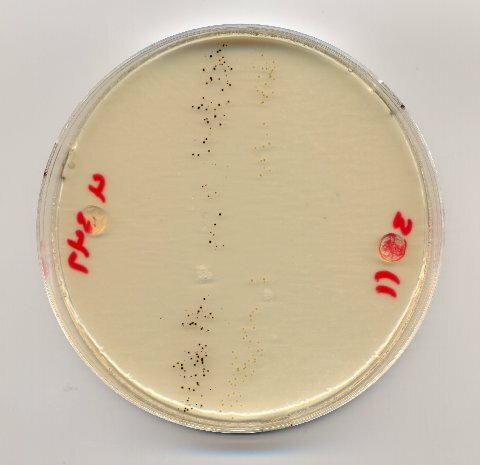 This double line is more difficult to discern where four strains are inoculated on one plate (Figure 1.B). The timing makes this a suitable exercise for students who meet once or twice each week. The inoculum could be set during the first week and the results would be visible by the second week. The plates do not change appreciably in the subsequent weeks and as such give students time to record their results. Figure 1. Mating between fluffy and fluffy perithecial-1 strains. A) two-strain cross. B) four strain cross. It is conceivable that this system could be used to present ‘unknowns’ to students, as described by Griffiths (1979), where matings are carried out to determine which strains carry opposite mating types. Alternatively, one strain could be given with known mating type and the student could be left to determine both the mating type and the nature of the per-1 locus (wt vs mutant) on additional strains. Additional loci could be included for student identification, including female fertility (ff) or perithecial neck (pen-1).